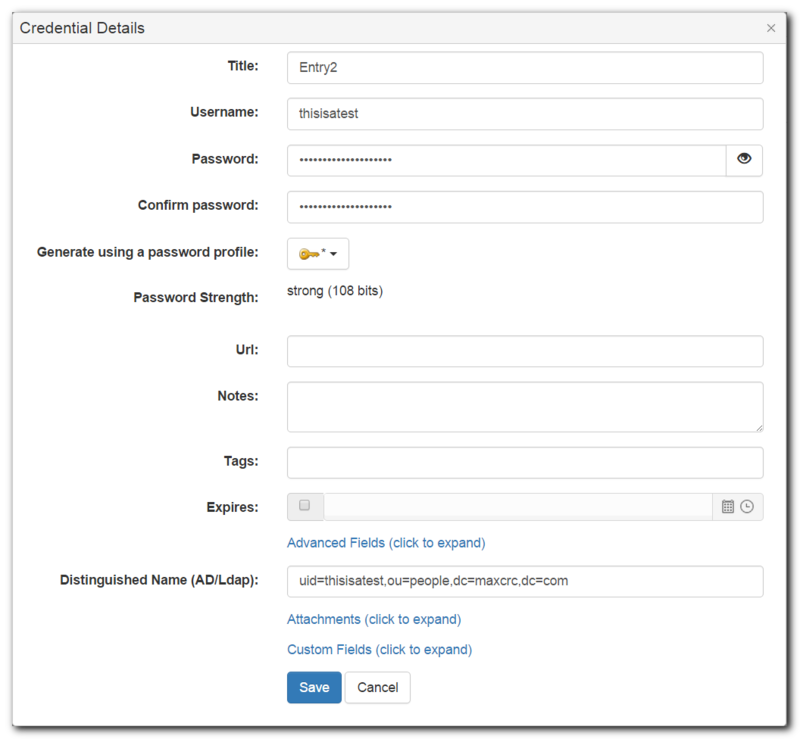 This feature allows a user to configure Password Server to automatically log in and change the credentials in a third party system (called a Credential Host). Update the password stored in the server. The dialog will show all the Credential Hosts currently configured for that folder and any parent folder up to the root. Clicking Add Credential Host will show a list of fields to define a new Credential host. Name: A name for the host. It can be anything. Password Profile: A profile that is used to generate new passwords. Default profile always is available. New profiles can be defined on the Password Profiles page. Schedule: Specifies the interval at which the passwords must be changed. Host Type: The type of host server that Password Server will log in to. 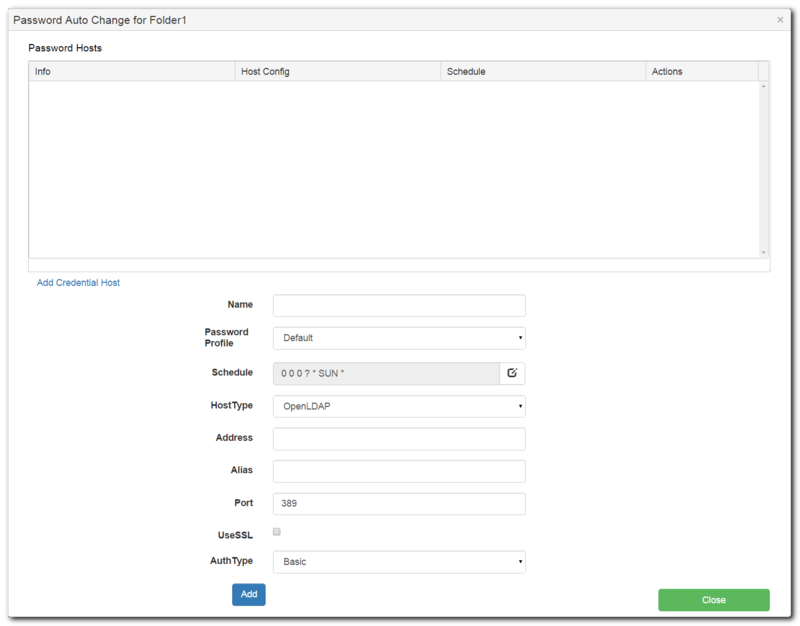 Changing the Host Type will determine the remaining fields in the form. Alias: The directory identifying portion of a fully-qualified username (user@alias). This is used to resolve conflicts with local users or users from multiple directories. The Kerberos authentication method also uses the alias to create fully qualified names for authentication. Port: The port number to use when connecting to the server. Port 389 is commonly used (636 for when SSL is selected). UseSSL: Whether or not the connection uses SSL. Connecting using SSL requires a valid SSL certificate. Authentication Type: The authentication method used when connecting to a server. Active directory normally uses Microsoft Negotiate. Other LDAP servers may use Basic or Kerberos, depending on how they are configured. Port: The port number to use when connecting to the Unix server. Communication with a Unix Host occurs over SSH which use port 22 by default. Note: After a Credential Host is defined, it cannot be modified for security reasons. It can however, be removed and recreated by a permitted user. Credential Hosts can also be added from 'Entry/Actions/Password Auto Change' (see below). Adding a Credential Host there will add it to the Folder containing the Entry instead. From there all the Credential Hosts inherited by the Entry will available for selection. Selecting the Host that the credential in the Entry belongs to do will schedule it to be changed when the Password Auto Change runs for that Host. Each Folder or Entry can only have one Credential Host selected at a time. Credential Hosts can also be selected from 'Folder Actions/Password Auto Change'. Note: Selecting a Host from 'Folder Actions/Password Auto Change' will select it for all Entries in the Folder and its Subfolders. This may result in previously selected Credential Hosts being changed.